Here's what was in my February Cruelty Free Shop Vegan Mystery Box! This was being advertised as their biggest box ever (in terms of value, I guess), so I had some high hopes. Vegan Honeycomb: This is the nekkid variety, not covered in chocolate. At first I was a bit 'meh', not the biggest fan of super sweet stuff. But I have found that this is not really all that sweet, and has some kind of nice almost charred undertone. Not really the word I am looking for, but I can't quite grasp the one I am after. Peanut Butter Banana Clif Bar: Crunchy Peanut Butter Clif Bars are the best, I have always been a bit let down by other flavours. So we'll see. Cautiously optimistic because at least it has peanut butter. Peas Please Sea Salt: These are crunchy little snacks based on green pea flour. I am always looking for savoury snacks, so I am keen to try these. 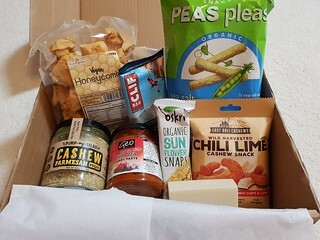 East Bali Cashews Chili Lime Cashews: I have had this brand before, they make these amazing cocoa covered cashews. However I will be gifting these to my friend Amy, aka the one who gets all my spicy stuff. Oskri Organic Sunflower Snap: Funny story, the morning before the package arrived, I was in a new organic shop and I was holding one of these in my hand debating getting one. I ended up getting one of their peach fruity ones instead, so this was a fun surprise. Pretty sure every Australian vegan is familar with the sesame snaps you get from the supermarkets, so I imagine these are like an upmarket version of them. Geo Organics Thai Red Curry Paste: Red curry paste is actually one spicy thing I do use, but at much lower quantities than recipes usually require. Just enough to get the red curry hint, without too much heat. I normally use the Thai Gourmet brand from Coles, so I wonder if this is hotter than that or not. Pimp My Salad Cashew Parmesan: I am pretty happy about this. Not something I would normally buy, as nut parmesan is easy enough to make, and most of the time I just use straight nooch. But I love cheesy things, so this is fun. Argan Oil Normal Hair Shampoo Bar: I have tried shampoo bars in the past, and I haven't had much success. Still, in the spirit of finding ways to use less waste I tried this bar. I was quite happy with the lather I was able to get out, and my hair felt squaky clean after. Almost a little too squeaky, I wonder if this is a bit too drying for my hair (they do have a dry hair version as well), but after some conditioning spray my hair felt pretty good. So I'll keep on using this and maybe I have found a package free solution for my shampoo. All up, a pretty good box. Only one thing that I have to give away! The shampoo bar I am really happy about, as I probably wouldn't have bought it given my previous experience with other bars. 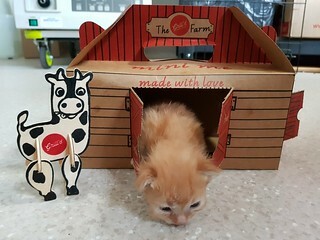 When work gets you Grill'd for lunch, and someone gets a kids meal that comes in a little barn box, and you have tiny kittens in the clinic.... well, can you blame us? What a nice box! The contents sound YUMMY and the cat house aftermath is just an additional PLUS! I love sesame snaps, I'm pretty sure I'm thinking of the same thing. UMM, yes you have to have kittens in the barn, and of course you have to share those pictures!!! I like your understanding. Of course kittens should be in the little barn! Oh, and I think I've had the banana peanut butter Cliff bar and loved it. Oh good! I normally eat Clif Bars before my fortnightly 5.45am yoga classes, so I will try that one next. OMG THAT BARN! Wolfie was convinced for awhile that it was a piggy not a kitten. Cute! They do have little funny faces and ears when they are so small. That sunflower seed snap bar sounds tasty- as does everything but the spicy nuts. Oh, and i hate bananas. But i do love peanut butter clif bars. I’ve not heard about a shampoo bar before... huh. I’m very particular about fragrances for stuff like shampoo and lotions so that would be what makes it or breaks it for me. I like bananas, but do not like fake banana flavour. I tried the Clif Bar, and am sad to say that it falls in the latter category. Peanut Butter Clif Bars forever! I recently had a similar snack to the Peas Please you got; they weren't something I'd get regularly, but they were fun to try. Kitten in a box, too cute! I haven't had them yet, so I will see what I think. I can't imagine buying them regularly though. But as you say, it is fun to try!